Official music video for Suzukisan's Torikaekko Please song. 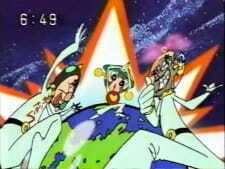 The song and characters had been used to promote the Pokémon franchise. Nintendo has revived the song for the 20th anniversary campaign. Torikaekko Please is a good 4 minites to spend. As for the aforementioned Song its a catchy early 2000s anime ost.